Having problems here. Dragging and dropping the .exe file doesn't seem to be doing anything in the setup window. The "search" tab won't find the program (most of the listed entries are in symbol font and all the help documents appear to be in Japanese). The "patch" button also remain grayed out. Navigate to the _inmm install folder (e.g. C:\_inmm\). Open _inmmcnf.ini with Notepad / your preferred text editor. Copy the below text and paste it at the end of the file. Save _inmmcnf.ini and exit Notepad. Unfortunately the CD music playback method used by Machines (and many other games from the 90s) is partially broken on Windows Vista and later, causing both of the issues you mentioned. With some effort, it's possible to work around the problem using an audio wrapper called _inmm.dll. In your Machines install folder, create a new folder "Music". 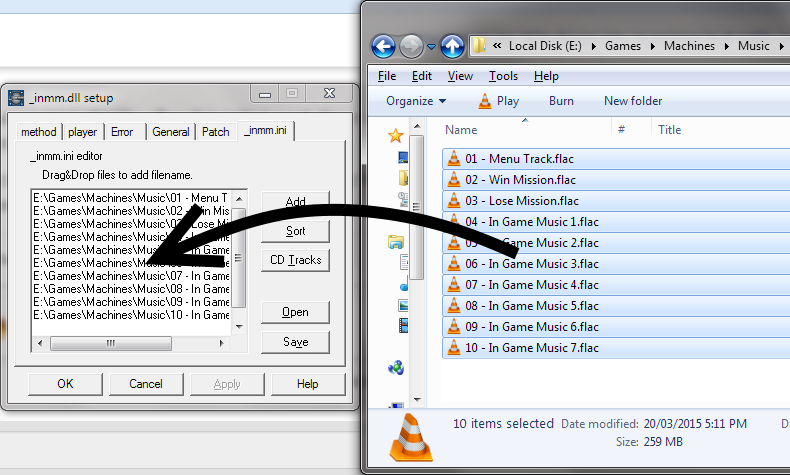 Rip the music files from the CD into that folder, or download the Machines OST and extract it to that folder. Make a backup of Machines.exe. Download _inmm238-installer.zip from here ("Download this file"). Extract it somewhere, then run _inmm238.exe to install the wrapper config / patcher program (to, for example C:\_inmm\). Navigate to the install folder and run _inmmcnf.exe. 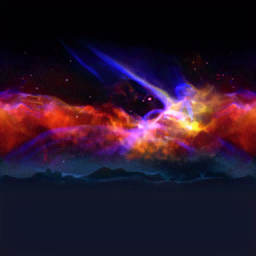 Edit the file types and players on the "Method" tab to match this image. Click on the "Patch" tab. Using Windows Explorer, navigate to your Machines install folder, then drag-and-drop Machines.exe onto the _inmm.dll setup window. When prompted "Patch these files? ", click OK.
Click on the "_inmm.ini" tab. 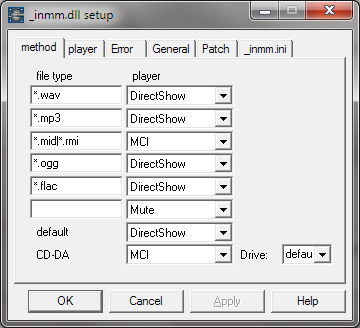 Using Windows Explorer, navigate to the Music folder in your Machines install folder, select all the music tracks, then drag-and-drop them onto the text box in the _inmm.dll setup window. Click "Save" and save the _inmm.ini in the root of the Machines install folder. 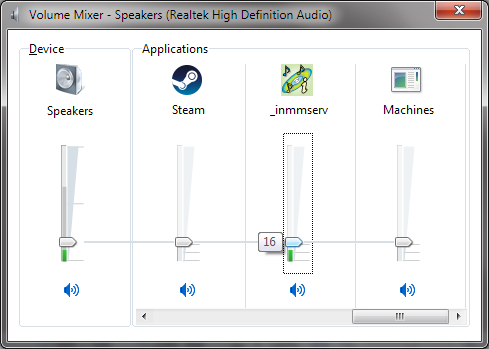 Tracks should now cycle correctly, and you can adjust music volume by using the Windows Volume Mixer to adjust the volume of _inmmserv separately from Machines. A bit awkward, but functional. Unfortunately the in-game volume sliders remain broken. Note: music may stutter when loading a level - may be affected by HDD read / access speed. Nice. I think @X-Lord did something similar with the unit textures a while ago. Since waifu2x algorithm smoothens everything and makes things look like a painting for the moon textures I also applied a HSV filter using Gimp to add some noise, so it has a more "sandy" look. I think it turned out quite well. 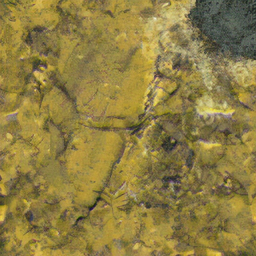 Since ice is supposed to look smooth, for ice textures I applied some noise only to the parts where there are rocks visible, but it didn't make much of a difference. It's also surprisingly good at handling dithering and banding (adding some noise after upscaling can help to mask new artifacts). @lew Nice, thanks lew (and Moritz!). If the demo installers behave similarly to the one for the released game, they might only work reliably on Windows XP / earlier. Forsaken EX release date announced: 31st July 2018. System Shock remake coming "late 2019/2020". Perhaps they'll do something around the 20th anniversary of the release of Machines - April / May 2019. Hmm, I don't have any experience with Chromebooks. You could try dgVoodoo 2 - if the integrated graphics chip (or its drivers) doesn't support old versions of Direct3D well, it may help. Edit: I got it working, just have that options issue thing now and some performance issue, particularly in fps. WIll now try dgVoodoo and see how it fares. Any idea what fixed the stuck on loading / crash on start issue? Might help some of the other users with similar issues. dgVoodoo 2 should help with FPS issues related to Windows 8 - 10. In some situations the game may still stutter a bit - day/night transitions in particular are a bit rough for me.